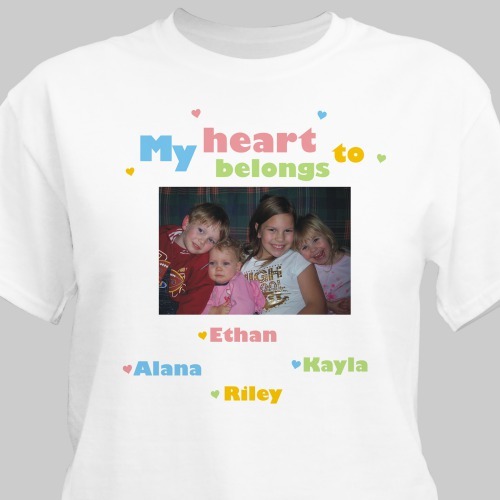 When your heart belongs to nothing but family and friends, show them off with this colorful Photo Personalzied T-Shirts. Our Photo Personalized Shirt is white, 100% cotton t-shirts, machine washable in adult sizes S-3XL. Free personalization of up to 30 names and any digital photo upload is included. Just simply upload any digital photo below. For production purposes, please enter a description that best describes the photo you are uploading. The transfer of the picture came out very well. Additional Details Show off your love for the entire family with personalized t-shirts, available at GiftsForYouNow.com. Our personalized apparel makes excellent gift ideas for all occasions.